call me so that i may discuss their exact requirements then we can narrow down some of the choices. 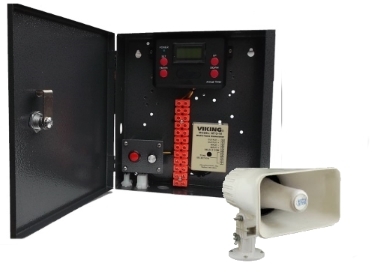 o have a quick discussion,  if you have an existing signal system we can integrate any one of our timers into that system. 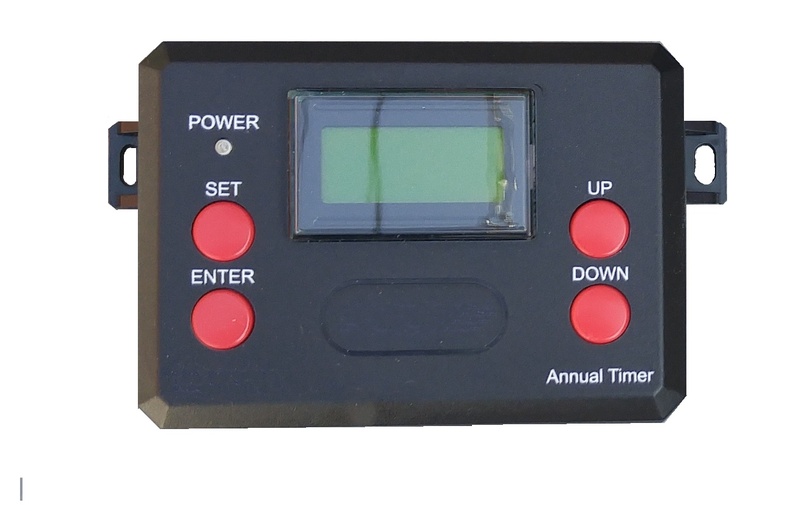 What Timer is best for You? 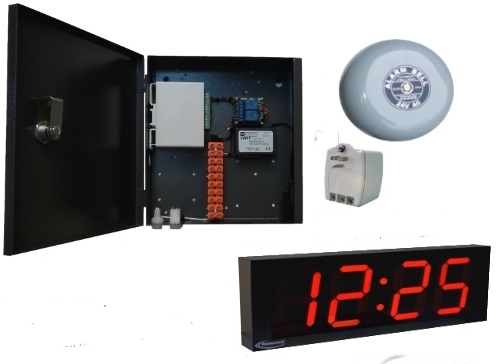 and has battery backup and automatic daylight savings with built in calendar..
8:00am for 4 seconds from Mon to Fri that would use  1 event so that would leave 49 more  available. 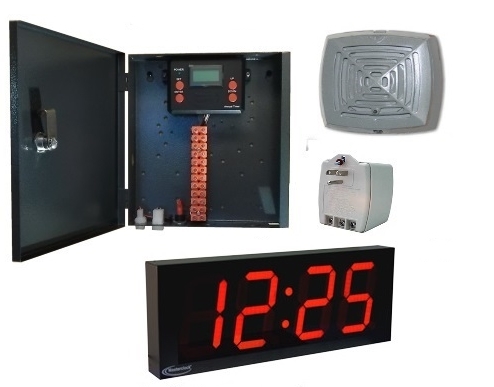 has a clock accuracy of +/- 20 seconds per month. then the next level up would be our. 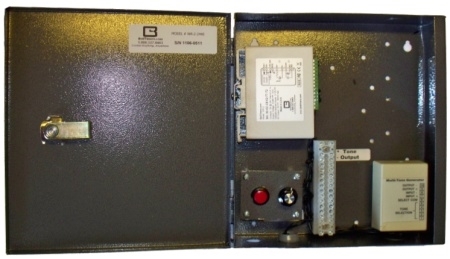 AutoBell or TK Series. 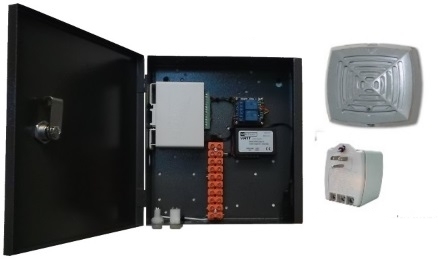 or Tablet when it is connected to your network via Wifi connectivity. 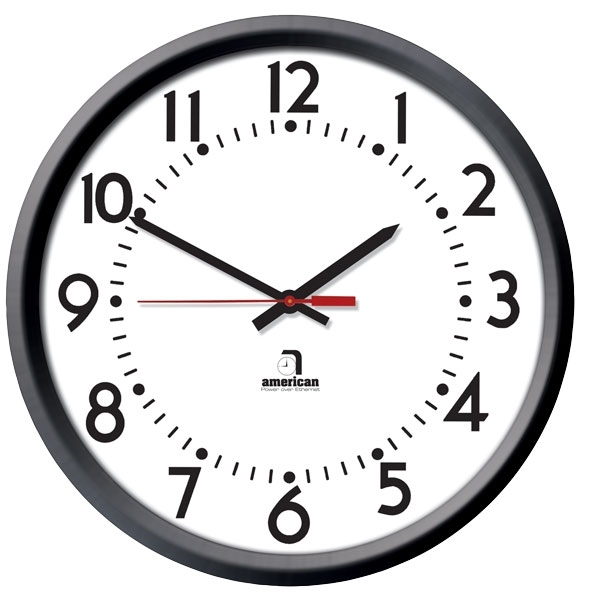 Atomic clock precision time control. 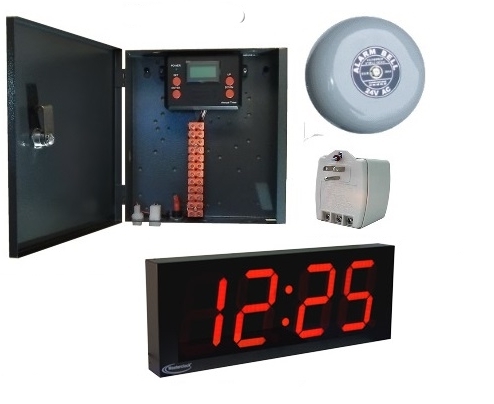 and school bell timers, we work with each client to  come up with a  cost effective solution based on your specific application. 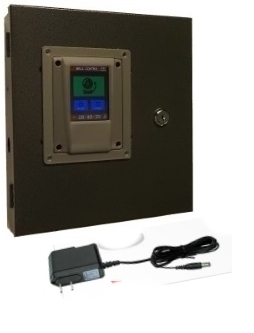 The PT series timer is our most popular and economical 7 day timer. 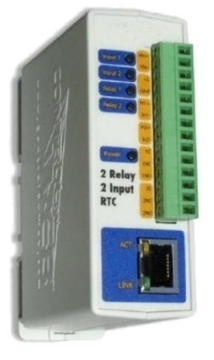 It has 2 programmable output relays. 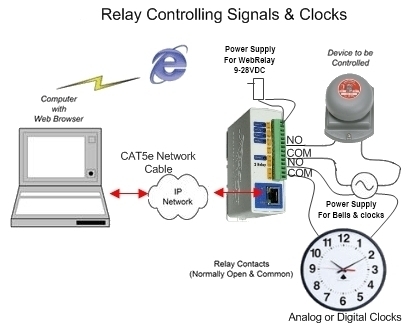 Each relay can be set to turn ON/OFF or momentary on (1 -99 seconds) for up to 50 events per day. 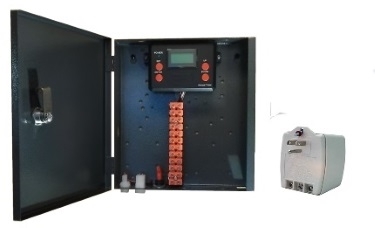 The timer is stand alone and has no interface for computer hookup, all settings are programmed through the 4 keys located on the front panel. 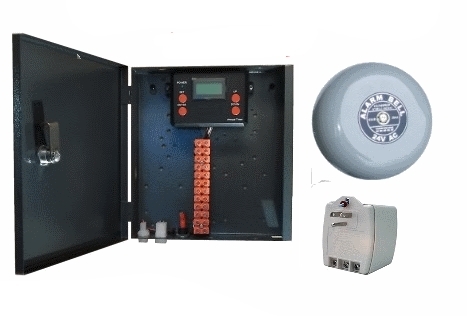 Accuracy of the timer is +/- 20 seconds per month. 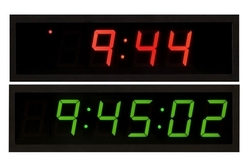 if you don't require time synchronize to NTP server or computer network interface then the PT timer is the timer of choice. 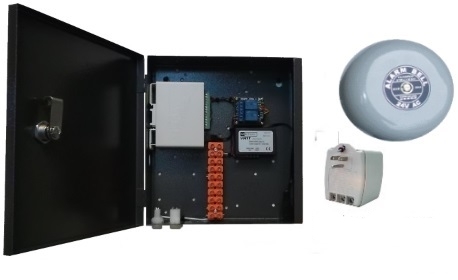 This is a complete Plug n Play package minus the signal device, suited for customers that have their own bell or buzzer and just require a reliable timer to activate it. 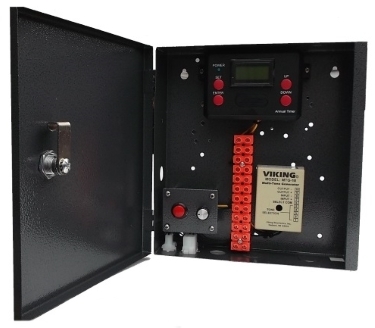 Size of metal box 9.5"x 8.0"x 2.0"
This is a complete Plug n Play package with a Model 43T 6 inch bell, ready to work out of the box. 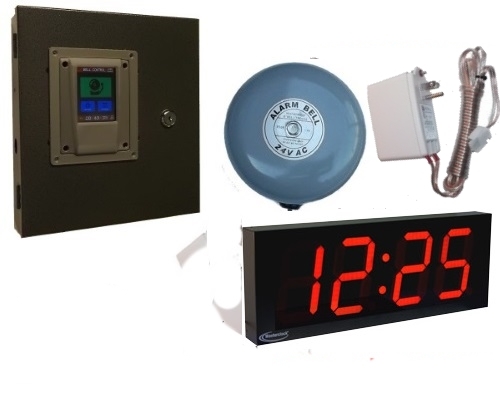 This is a complete Plug n Play package , it includes everything including a 4 inch display digital clock, for customers that require a digital clock to display correct time in a larger format for all employees to see. 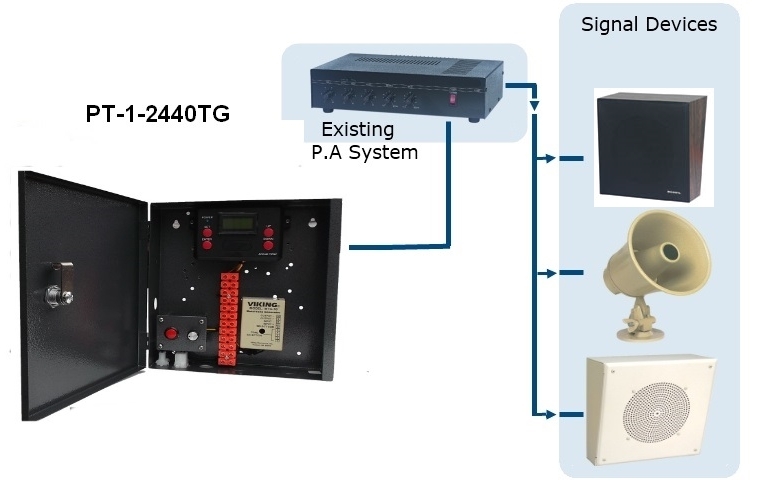 Output is line level output (600ohm) to paging amplifier or self amplified speaker. 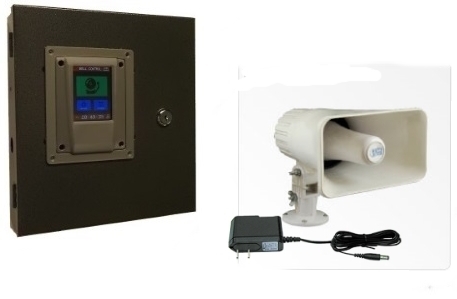 This is a complete Plug n Play package including a self amplified horn speaker, suited for customers that do not have a central paging system and require a audible tone rather than a traditional bell or buzzer sound. 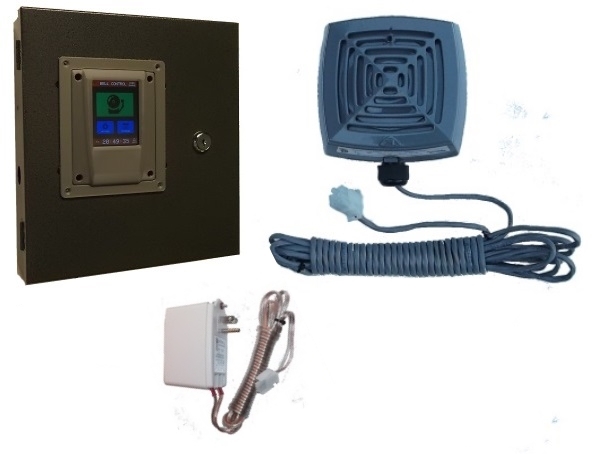 This is a complete Plug n Play package , includes wireless transmitter and wireless remote buzzer station. 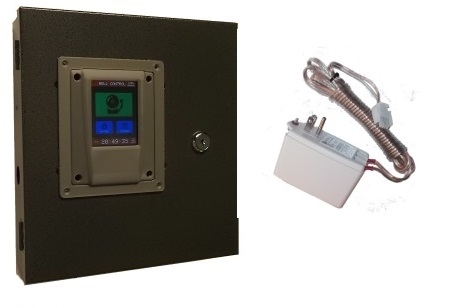 No need for wires just plug timer/transmitter and remote buzzer into any regular AC receptacle and ready to work out of the box. 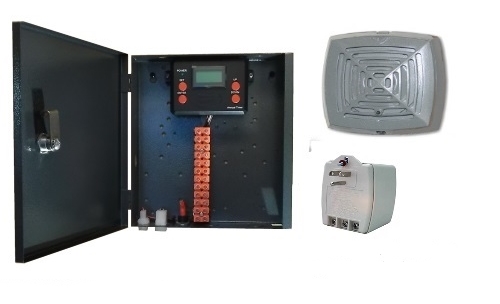 Access Control, Turning ON/OFF Lights, HVAC, Pumps, Fans any circuit that needs to operate on a timed ON/OFF or momentary ON/OFF Control. 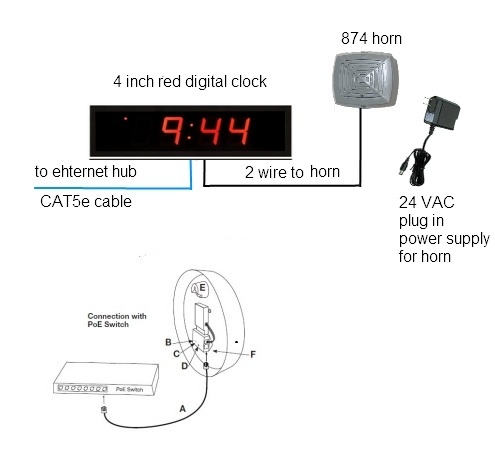 and reference the Atomic clock over Wifi network. 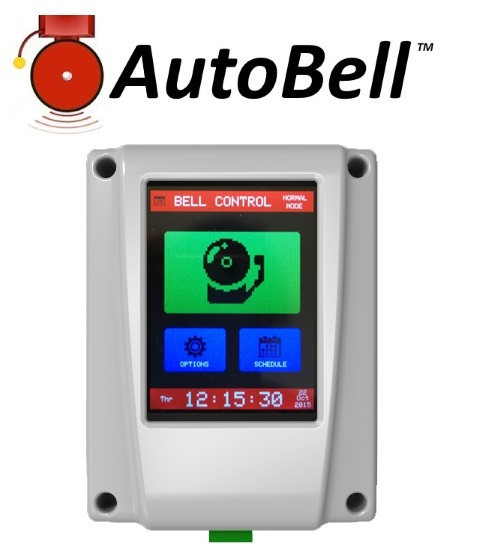 No other timer offers the accuracy and ease of use than the AutoBell timer provides. 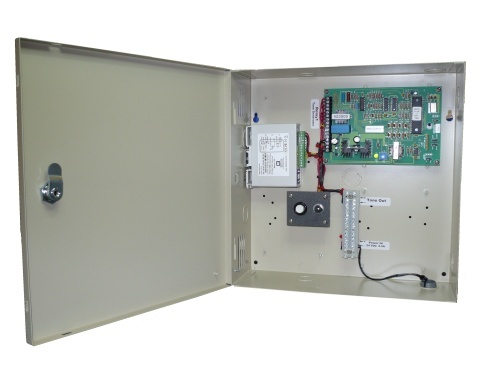 Touch Screen Programming...now programming is easier than ever, just like navigating on your smart Phone. 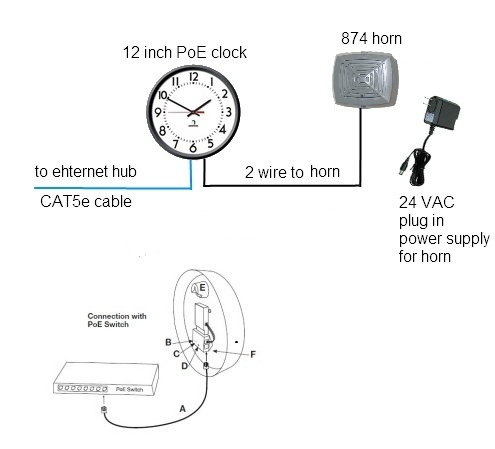 Increased Time accuracy!... 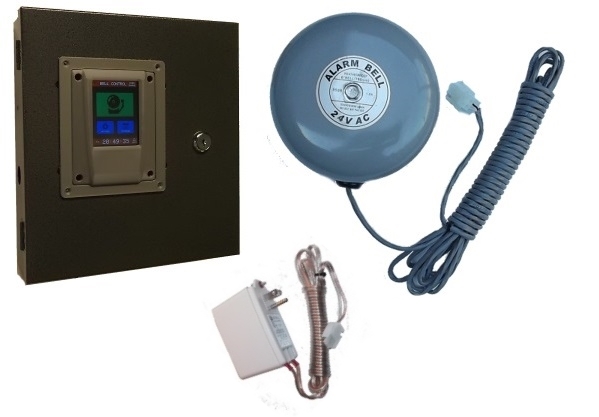 No more annoying Time Drift, with Autobell we have completely eliminated time drift the AutoBell has the ability to set its time to the Atomic clock just like that of your Cell phone. 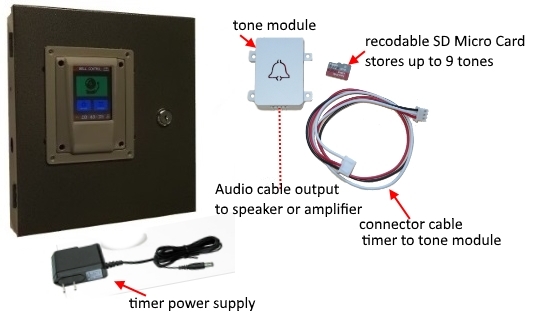 Play tones instead of traditional buzzer or bell, even record text messages that can be broadcasted over self amplified speaker or over Paging system speakers. 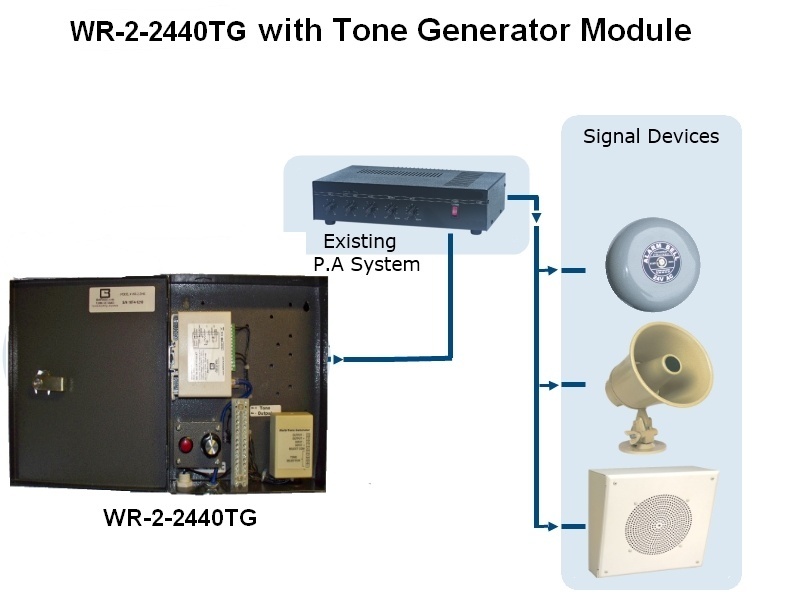 If you do have a paging system then select the TK-2440-TG and the timer will utilize your existing paging speakers to broadcast a tone. 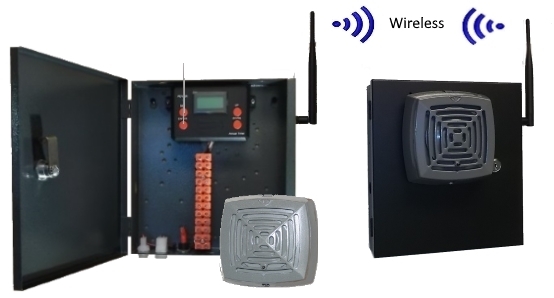 WR-2 Controller is an programmable network relay with built-in web page interface, allowing complete control from any network connected web browser. 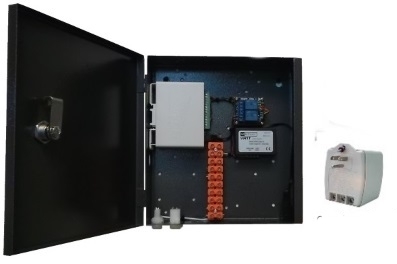 It can be controlled and or monitored over any IP network, including private networks, IP based industrial control networks and the Internet. 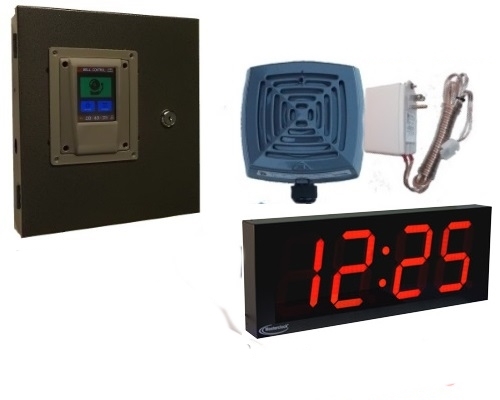 The WR-2 unit allows for total synchronization of your factory bells or horns as well as operate analog and digital wall clocks throughout your facility. 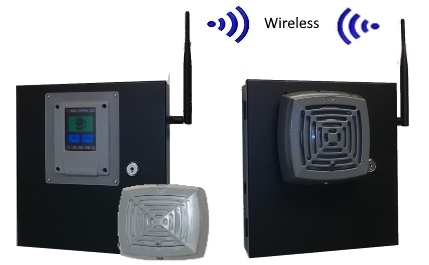 The WR-2 unit can be connected to any computer or network by simple ethernet connection, it can be programmed and operate off-line or in stand alone mode.